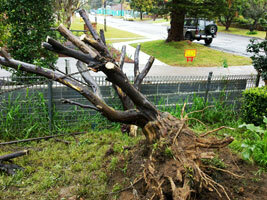 Sydney Tree Removals offers dead tree removal and emergency tree removal in the Dural. Since dead trees and emergency situations often do not require local council permits to remove we can remove the dangerous tree without having to wait for a council tree removal permit. We also offer a wide range of other tree removal services in the Dural such as tree stump grinding, powerline clearance pine & palm tree removal and tree maintenance. 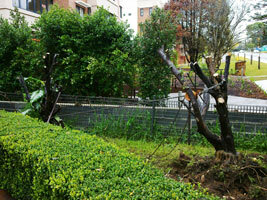 Our Dural tree removal costs are competitive. Our customers in the Dural of Sydney choose us because we offer tree and stump removal at affordable prices and with friendly flexible staff. We offer free tree removal quotes, and perform our Dural tree services quickly and proficiently so your tree cutting service doesn't have to be a complicated ordeal. Did you know you can be fined and taken to the Land and Environment Court for illegally removing a tree in the Dural region? If you are having difficulty with your local council's removal permit or understanding your council's tree preservation order - we can help identify trees, palms, or branches for removal or pruning. We can even help you get a tree removal permit for Dural. All our tree pruning in Dural is carried out in accordance with Australian Standards (AS 4373-2007). This ensures that the best industry practices are used on your tree and you can be confident in our workmanship.